Home / Focus on Pages / Is explosive crude oil traveling through your community? Is explosive crude oil traveling through your community? Trainloads of crude oil from the Bakken shale in ND do pass through the Valley — and these trains travel through the center of Allentown, Bethlehem, and Easton, often right next to the Lehigh River. This raises major safety concerns and serious questions about how to protect people. 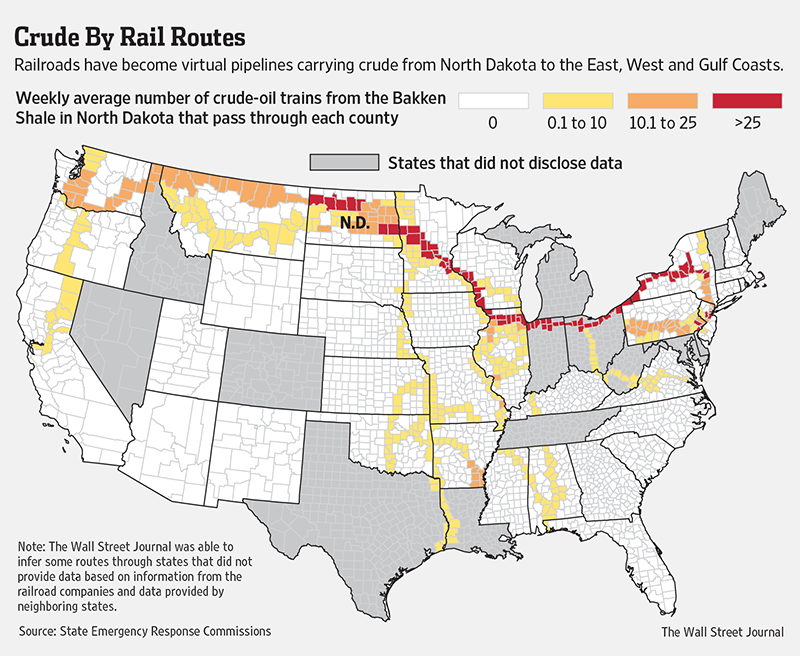 The Wall Street Journal‘s map of rail shipments estimates 1–10 trains/wk on the Norfolk Southern line. One tank car holds over 30,000 gallons, so a typical train of 100+ cars would be carrying 3-million gallons or more! See Feb. 2015 report from PennEnvironment on dangers of shipping explosive crude by rail. This Oil Trains Blast Zones map shows the evacuation zones [red], with the danger zones [yellow] extending another half mile. Note: The maps above deal with explosive crude from the Bakken Shale, but there is also a significant volume of Liquified Petroleum Gas beginning to move through the Lehigh Valley from the Marcellus Shale region. Although the cars used for LPG are probably better built than the crude oil cars because of the pressure needed to liquify the gas, they are still vulnerable. We haven’t yet been able to find any clear reports of volume or frequency of these trains, but we have seen them moving through Bethlehem. Who responds if there is an emergency? It’s up to local fire departments and emergency-management agencies to plan for such disasters, and this is done at taxpayer expense. The railroads do not notify the public or agencies or help financially, and they do not have disaster-response plans that could cope with catastrophes of this magnitude. What is the biggest risk from these shipments. In the long term, the biggest risk for most is simply that these shipments mean more fossil fuels being extracted and burned. Global warming is now being recognized as the biggest public health threat of these times.